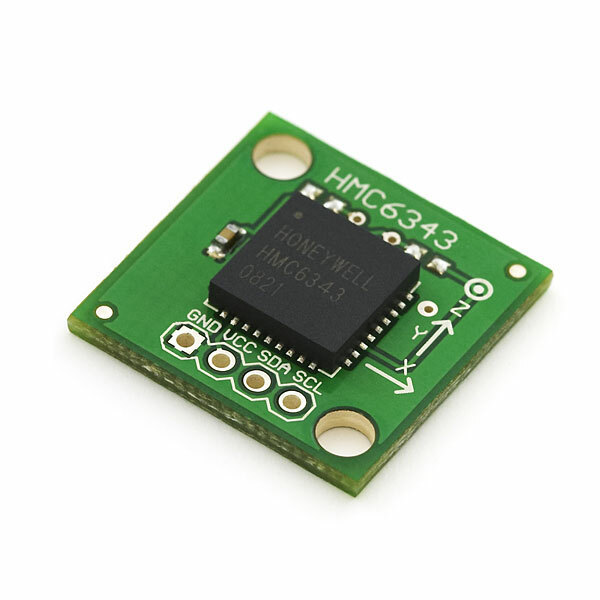 The HMC6343 is a solid-state compass module with tilt compensation from Honeywell. 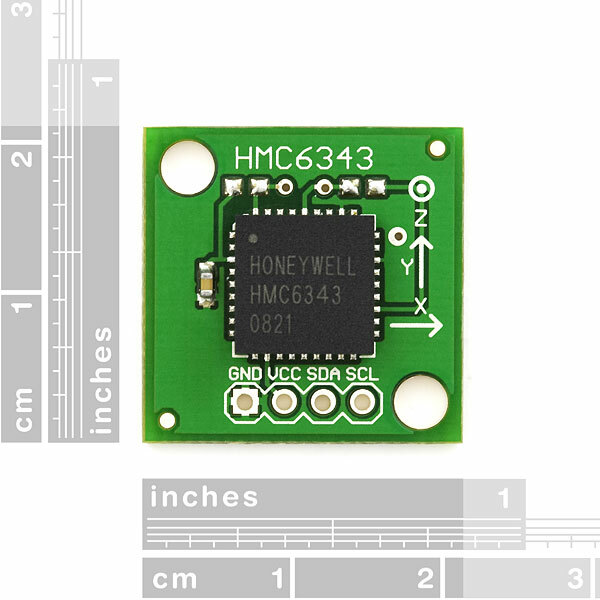 The HMC6343 has three axis of magneto, three axis of accelerometer, and a PIC core running all the calculations. What you get is a compass heading over I2C that stays the same even as you tilt the board. Solid-state (and many classic water based) compasses fail badly when not held flat. The tilt compensated HMC6343 is crucial for those real-world compass applications. Who says robots have to stay flat? Hope this might prove itself useful for somebody. How do these perform with vibrations? I tested this chip with vibration from a diesel engine at various RPMs and it faired poorly. The heading varied by +/- 15 degrees at times. It behaved similarly when I repeatedly bumped the wooden test bench it was mounted to. I tried different mounting methods, including using vibration dampening gel tape (used in RC helicopter gyro mounts) but nothing seemed to make much difference. The 2 dimensional HMC 6352 was much more vibration resistant but of course it suffers significant accuracy loss when tilted more than a few degrees. After testing several other accelerometer + magnetometer solutions for vibration sensivity, I came to the conclusion that a gyroscope was a necessary component. I ended up using the CH Robotics UM6-LT which has a gyroscope. It has been extremely vibration resistant, and was similarly priced to the 6343. I have two questions regarding the HMC6343. 1) I understand that the x, y, and z magnetic field readings are each returned as 2 byte value. What are the units for these values? How can I convert them to more familiar units, such as Gauss? 2) The temperature reading is also a 2 byte value. How can I convert this to degrees C? could you please send me example AVR code? can you add the breakout board to the SFE Eagle library please? Is this supposed to have a temperature dependence? I tried testing this over a range of temperatures using a peltier cooler and ended up getting a linear temp dependence. The peltier cooler is a current device. Temp depends on current, more current also means higher local magnetic field. Could it be that your "temp dependance" is actually due to the magnetic field of the current through the peltier device? Does anyone know if this comes with the board as shown in the image? I bought this and board is red, not the same as pictured. 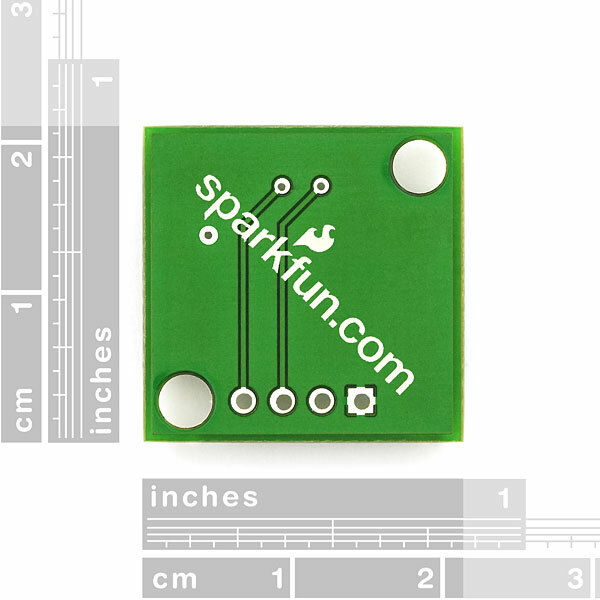 I couldn't get it working with arduino uno and we are trying to figure out with sparkfun support. Why is this so gosh-darned expensive compared to all the other compasses you have? all the other bobs hover around 30 bucks or so. what does this one have over those? This gives all euler angles in one compact unit with 3 axis compensation. Same thing like imu9 which has similar price. I got this unit but unfortunately does not run with arduino uno, still waiting for support to figure it out. Can someone post Arduino Uno code for this item? I can't get this working although my code looks right and I asked sparkfun to try and they seem to get nothing with my code. are there any socket/connectors for this? The datasheet says to degauss the sensor if this happens, but doesn't explain how to degauss the part. Is the degaussing part supposed to be common knowledge, or is there a specific way to perform it with this sensor? Perhaps you can help me out with a bit of this code as well. It seems as though >int slaveAddress> and have to be dimensionalized. I am using this code for autonomous navigation and when I placed it into the header file and into the main header, then I still had to create those two variables because they did not exist. In the header file, they are private. In the code example provided below (thank you!!!) I noticed that the wire.send is for 0x50, whereas the documentation specifies 0x32 for the heading. Can anyone clarify this? Thank you again. i just got the chip a week or 2 ago and haven't powered it up but i hope i understand the coding example from FreeGroup. hope that helps. i will try it in the next few days and see if i really do understand it. I couldn't find this in the datasheet, but does this output pitch and roll tilt angles? Or just 1 tilt output? On page 10 of the datasheet - the command table shows you what data it can output. Has anyone gotten this compass to work with the Devantech usb-i2c module? After frustrated coding, and finally scoping the data and clock lines, my conclusion is that this compass utilizes clock stretching which the Devantech module does not support. I would love to hear otherwise, if anyone has gotten it to work. Thanks. Hey p07gbar I'm using this device with 5v output from my arduino and it's running fine. And syvwich, yes, I do believe that that's what the cap is and that's what it is for as recommended in the HMC6343's datasheet. Lastly, this thing is fun and easy to work with, but I may have accidentally reset my hard iron offsets because my compass heading is giving me errors. The tilt and pitch are fine though. Thanks for breaking this out Sparkfun! What are you talking about? The data sheet clearly says 3.6V max. I'm now afraid I've blown my chip listening to commenter advice. It never seems to send any data back i.e. Wire.available() never becomes true. Can you share the arduino code with us? Can this chip cope with a +5V input for control logic? Could you please confirm that the small surface mount component to the left of the chip is a 1uF capacitor to eliminate noise from the power supply? If it is not, could you say what it is, and what it is for?